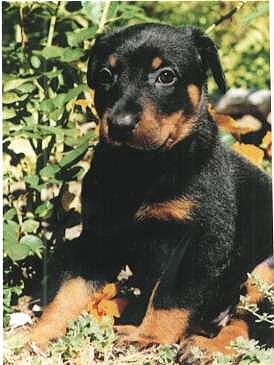 The Beauceron is a natural herding dog, and they enjoy the challenge of working. They demand a great deal of vigorous exercise, and are much better off in a setting where they can run free. They are loyal and protective and make great guard dogs. Early socialization with children should make them a fine family pet. Early, firm training will establish the pecking order, and a Beauceron does well with a consistent handler. 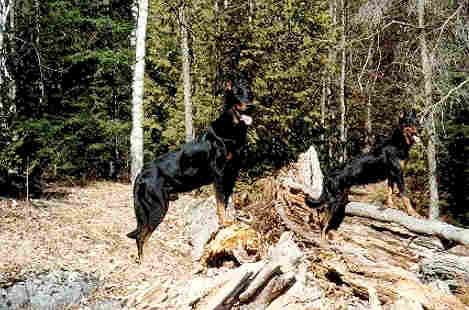 If not socialized with other canines the Beauceron will be very territorial. Minimal brushing is necessary. Medium Minimal Guard Dog. Lots of exercise. We STRONGLY recommend that you get your dog from a respectable breeder or rescue organization. Pet store puppies may get their dogs from Puppy Mills that normally breed only for profit, not quality or concern for the puppy or its eventual owner. If you would like help locating a breeder or rescue agency near you please E-Mail PGAA ( ita408@comcast.net), and let us know your city/state and the type of dog you are looking for. Do not assume that PGAA has qualified all of the breeders or rescues on this site. Do your own check of each breeder or rescue — be sure that you are comfortable with the organization before you buy, adopt or turn-over a dog.